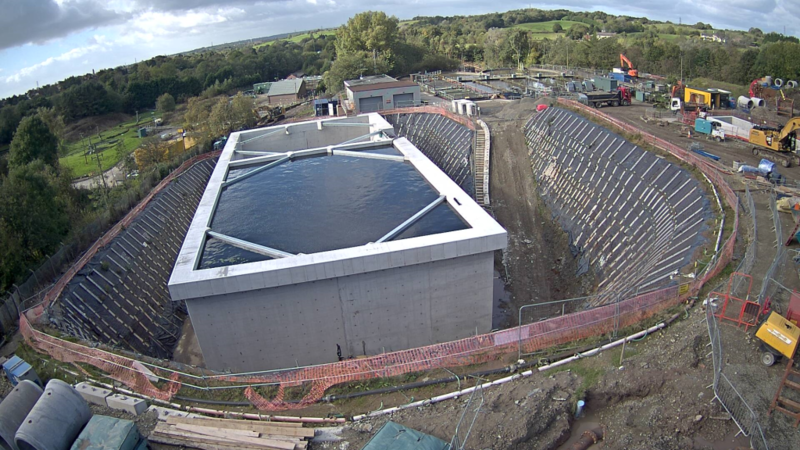 As part of the Oldham Royton Integration Strategy (ORIS), a 25m x 50m storm water detention tank was to be constructed by Farrans Construction Ltd. A formation level of up to 14m below existing ground level required a novel approach for stabilisation of the temporary batters. Typical solutions such as a secant pile wall or sheet pile wall were not appropriate due to the lack of flexibility to avoid existing infrastructure. This was a particularly challenging project due to the variable soil conditions, anthropogenic hazards and high water table encountered at the site. Operation and movement of plant at the top of the batters also had to be accounted for. OGI proposed The Stable-Earth™ system which comprises groundwater management, slope reinforcement and erosion control. The approach proposed by OGI was flexible and enabled OGI’s engineer to adjust the placement and frequency of the Platipus anchors as necessary. OGI specified the groundwater control system which was installed by Alba Dewatering. This aided the construction process and reduced the anchor requirement. To design the batters in accordance to Eurocode 7, finite element software was utilised in the form of PLAXIS 2D. 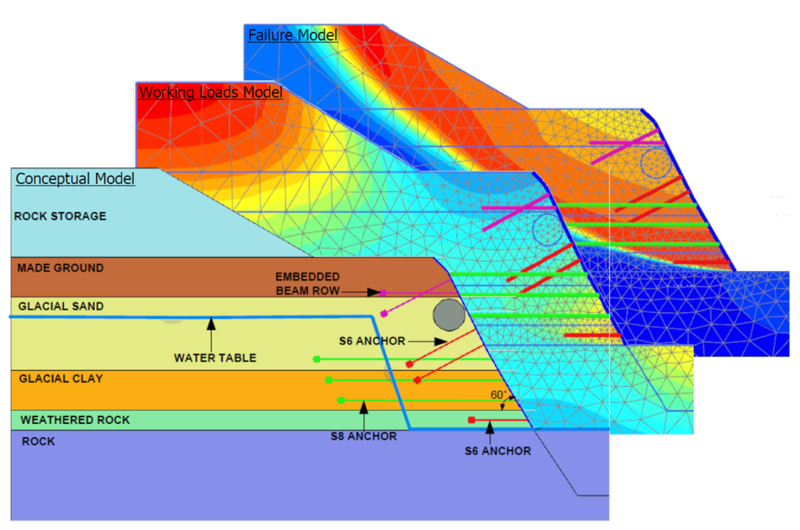 This software enables complex geometry to be assessed and can account for the failure mechanism of the soil around the anchors, strength of the cable and pre-stressing of the anchor. OGI prepared and analysed a number of models depending on the constraints around the perimeter of the tank and the anthropogenic hazards encountered. The first output model was used to check displacements and show stability can be maintained for the load regime for that particular phase. The second output model was used to determine the factor of safety of the design. The Stable-Earth™ system was particularly well suited to the bridging over of existing infrastructure as shown below. With careful and meticulous design, live pipelines and a manhole were protected as part of the slope stabilisation works. 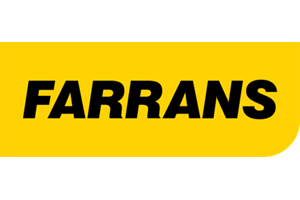 The continued support provided by OGI allowed Farrans to effectively manage the construction programme without relying on specialist contractors to install the slope stabilisation system. This reduced the risk of additional contractor costs as a result of standing time. Furthermore, the flexibility of the Stable-Earth™ system enabled live infrastructure to be secured and could enable variable loads to be safely applied at ground level. 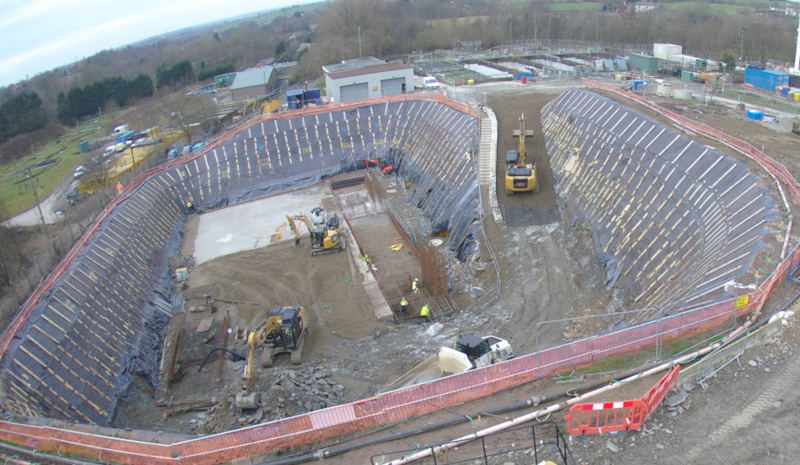 The use of the Stable-Earth™ system for this large scale infrastructure project has demonstrated the viability of using cost effective materials to stabilise steep batters for temporary excavation works.